When I first booked this Asia trip, I was rather worried about traveling during monsoon season. I pictured myself trying to make my way around India, Thailand, Vietnam, and Cambodia in constant, torrential rain. I thought I would be living in my raincoat and water shoes. And then I actually took the time to read about the monsoon. Sure, there is a lot of rain, but it tends to come in short (albeit rather heavy) spurts. Well, shoot, that sounds like summer in Alabama. No problem! And for most of the trip, it really wasn't a problem. Sure, it rained on me a few times, but not to the extent that I thought the ominous-sounding word "monsoon" entailed. Not until we arrived in Cambodia, at least. The monsoon gods decided that we couldn't escape the continent without a proper understanding of what the monsoon can truly unleash. And that's how I ended up literally wading my way around Siem Reap on my very last day of the trip. The torrential rains that Dan and I hadn't exactly managed to escape over the previous couple of days swelled the Siem Reap River far past the capacity of its banks. On my final morning, I woke up to the sight of the river lapping at the entrance to my hotel. My water sandals had broken just days before in the Mekong Delta. The only functioning shoes I had left were sneakers. I could hear the monsoon gods laughing. It didn't take me long to realize that a 6-inch cover of water barely fazed the locals. In the US, such an occurrence would shut down a town and make the national news. But Siem Reap barely blinked. Motorbikes and tuk-tuks still traversed the streets. Vendors still pedaled their wares. Children went nuts playing in the street. The hotel manager's son made a grand event out of it by sporting an umbrella hat and floating around the hotel entrance on an inflatable raft. So what's a tourist to do when this city floods? Wade barefoot through the streets, give in to taking a tuk-tuk ride to the Angkor Museum (as opposed to walking - or wading), and sit around drinking lots of coffee and beer. I hired a tuk-tuk driver from the hotel entrance to take me all of 1 mile north to the Angkor Museum. I sloshed my way into the backseat, and he drove through the flooded streets to deliver me to the entrance. I had to get a little creative for this endeavor since I didn't have appropriate flood footwear. I packed my sneakers and a small towel in my bag, and when he pulled up to the museum, I dried off my lower legs, slipped on the shoes, and hopped out onto dry concrete. Easy. I probably looked pretty goofy, though. But this excursion made me think - Mother Nature is certainly a force to be respected and feared, but perhaps that fear is sometimes blown out of proportion on this side of the Atlantic. 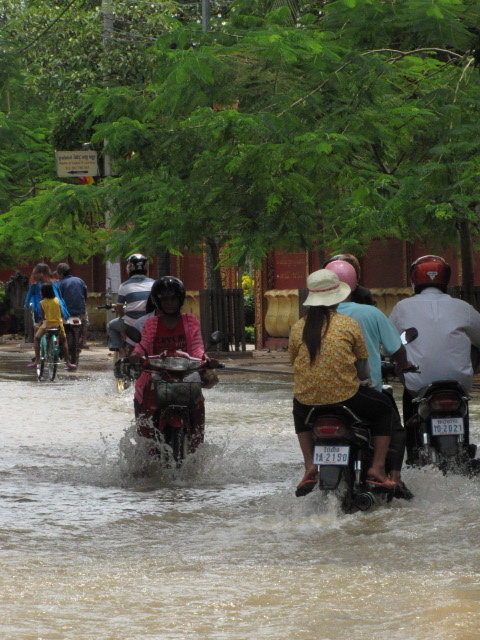 The Cambodians weren't freaking out about a mere 6 inches of water. But then again, they survived the brutality of the Khmer Rouge, so some minor flooding is probably inconsequential to them. It's all about perspective. You are so right. Living someplace with temperatures at 20 below sounds like torture to me, but there are people who don't mind. More power to them. And congratulations on the baby! He/she will have a fantastic place to grow up in!